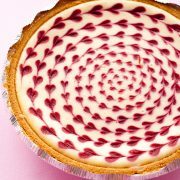 I use to wonder if there was anything better than white chocolate raspberry cheesecake, but I have found it’s competitor! 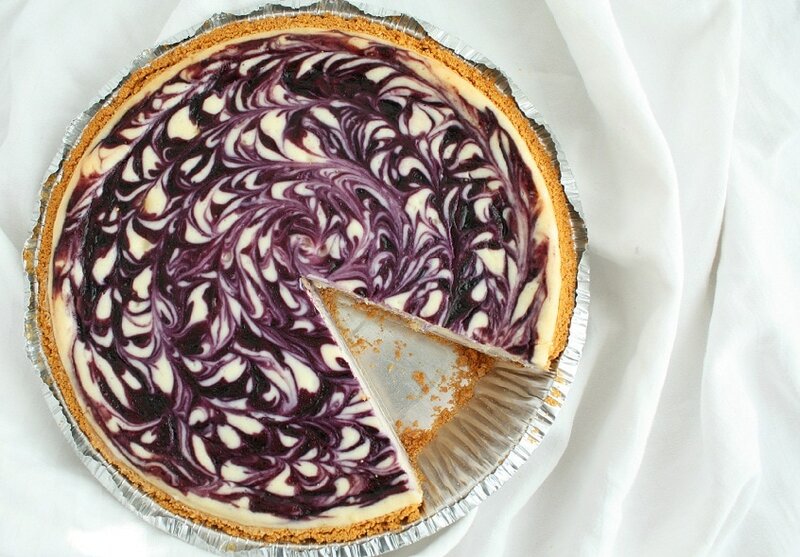 White chocolate blueberry cheesecake. I’ve made the white chocolate raspberry cheesecake for years (see the recipe here) because it was my favorite so I just didn’t have the desire to try something else. Last week I decided it was time to give another berry a chance. This is the second time I have made this cheesecake and I am in love! The blueberry, cream cheese, and white chocolate mixture is divine! And the hint of lemon compliments the blueberry so well, it brings out its outstanding natural flavor. 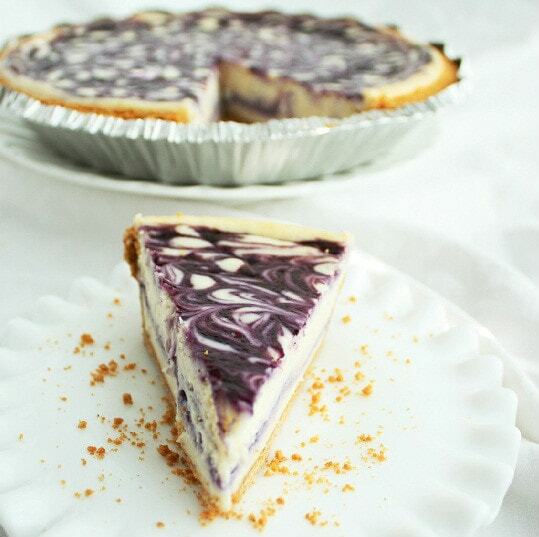 This cheesecake is so simple to make, you start with a pre-made crust so it doesn’t get much easier =). Just be sure to plan in advance because this cheesecake needs 6 hours to chill in the refrigerator to set. 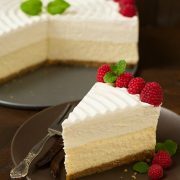 Six long hours of patiently waiting to eat this luxurious mouthwatering cheesecake =). You'll love this combination of sweet blueberries and tangy cream cheese. Uses a store-bought crust to save a step. Preheat oven to 325 degrees. In a small saucepan, whisk together 1 Tbsp sugar and cornstarch until well blended. Stir in cold water, blueberries and 2 tsp lemon juice. Cook over medium heat whisking often until mixture begins to boil lightly. Boil 30 seconds whisking constantly. Remove from heat and force mixture through a fine mesh strainer into a bowl (to remove blueberry skins), set mixture aside. In a large mixing bowl, with an electric mixer, beat together cream cheese and granulated sugar until fluffy, about 1 minute. Mix in egg and egg white. Add vanilla and lemon juice. Set mixture aside. Combine white chocolate chips and cream in a microwave safe bowl and microwave mixture on 50% power in 30 second intervals, stirring after each interval until chocolate is melted and smooth. Add melted chocolate mixture to cream cheese mixture and blend until smooth. 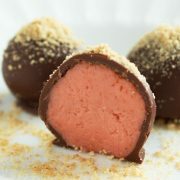 Pour 2/3 cup cheesecake mixture into the graham cracker crust and spread evenly over bottom. Drizzle with 2 Tbsp blueberry sauce. Slowly ladle remaining cheesecake mixture over the drizzled blueberry sauce, covering all of the blueberry sauce. Carefully giggle the pan to even out the top. Drizzle 1 1/2 - 2 Tbsp blueberry sauce over top (reserve remaining blueberry sauce in refrigerator). Take a knife and swirl it through the cheesecake to marble blueberry sauce. 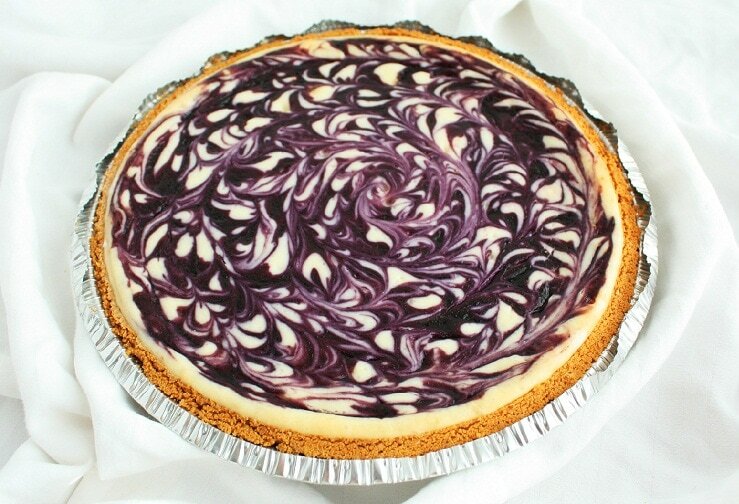 Bake cheesecake in center of the oven for 40 minutes, then turn oven off and leave cheesecake in the oven for 5 more minutes. 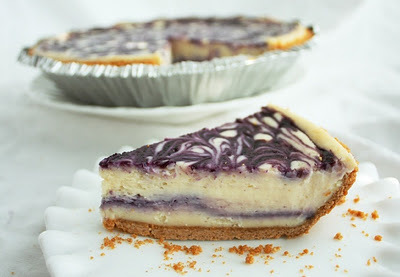 Remove from oven and allow to cool then refrigerate cheesecake for 6 hours, until set. Serve slices with remaining blueberry sauce. Themeisel: I wish I could post my pic!! :) I made this today but stole the hearts idea and everyone raved. I made a few changes. Sauce: added lemon and lime zest. Saved the “smashed berries and made it a compote. I put this on bottom instead of just the syrup. I also had extra syrup left so mixed it with fresh blueberries, poured it on top.